FO Friday 09/13/13, Face The Facts Friday, Whaaaaa…..
I’m again hooking up with Tami’s FO Friday blog and Frontier Dreams KCCO. If you’ve been sort of keeping up with my sock project the last week or so, you’ll know I started a pair of Blue Day socks last week, knowing full well that I didn’t have enough yarn to complete them. Even with my little feet, I just couldn’t shake that feeling that I was going to come up short. No problem, I can always get more yarn. Wrong, wrong, wrong. 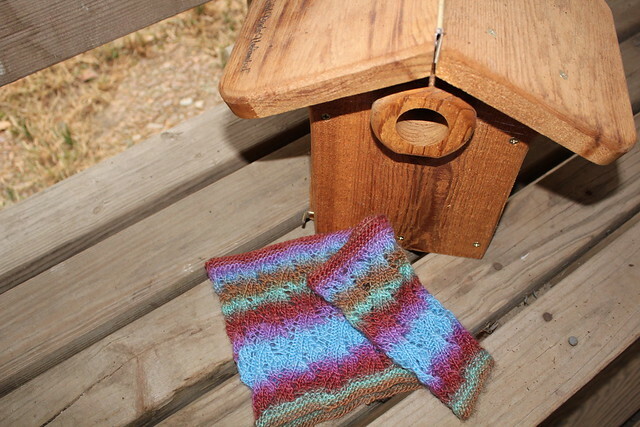 I started these using Fiesta Yarns Baby Boom, in the color Sweet Pea. Yeah, I saw that I’d paid a LOT for this one skein, especially when you’re talking just one sock of a pair, but still, sacrifices can be made. The ONLY skein I found after hours of internet searching was $47.00!!! As much as this Sweet Pea stuff floats my boat, $47.00 for a sock??? Not even in loonyhoot’s world can that be justified. So, I gritted my teeth and completely frogged Blue Day and plan to use – thanks to better judgement and a deeper stash dive – some great sock yarn I remember buying on Etsy. I even remember the color name – Civil Disobedience and, I have a lot of it. Plenty for Blue Day and maybe then some. No decision on different sock pattern, but it’ll happen. I finished the Diagnonal Lace Cowl from Classic Elite Yarns, just in time for today’s post. It took just under one ball of Mini Mochi, color number 113 (no name, just number). I probably could have squeezed a few more rounds in, but being paranoid because of the abovementioned sock thing, I decided to give myself a little wiggle room. My fingernails thanked me. I think its official name is Lacy Rib Cowl. 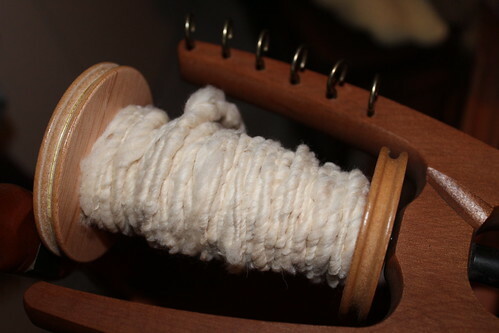 Here’s what I learned today spinning: cotton spins up differently than wool. Duh. It felt completely different, it took a different “hand” I suppose you’d call it and seemed to be a little more nubby; that could have been, really, that I’m a newbie spinner and nothing I’ve spun up yet is what you’d call smooth. It’s getting better, but smooth? Nope. Luckily, the person I bought my wheel from threw in a couple of bags of raw fiber – one of wool and one of cotton, giving me a lot of chances to practice and try out different things. I’ve spun my way though them both, glad that she was generous enough to include them. I see a serious roving/fleece stash building – especially after the festival in Greenwood in October. Spinning wheel Violet and I are becoming better acquainted all the time, I’m learning her quirks and she, mine. It’s a few degrees cooler this morning and I’m revved up and ready to do some baking, hopefully Cinnamon and Sugar Pull Apart Bread and/or Snickerdoodle Bread. Unhappily, I can’t seem to be able to buy cinnamon chips here in LR. I found a package once, at the Stuttgart Wal-Mart. I suppose I could order a couple of packs online and the recipe I have includes a recipe for the chips, but I think the store bought ones are better (for once). She continues her decline with her dementia. I miss her and would love to occasionally be met with a smile and an I’m happy to see you instead of the now normal vacant stare. I do know that this is the disease and all that, but a little bit of responsiveness can keep me going for quite a while. 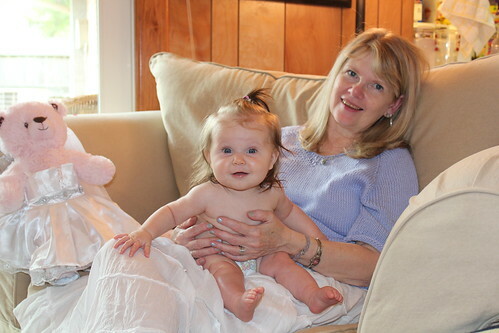 There are some days I terribly dread visiting and I wonder how long – for her and for me. What do I pray for?? Sorry for the Debbie Downer…. FO Friday 06/14/13, Best SIL Ever, Too Hot To Bake? 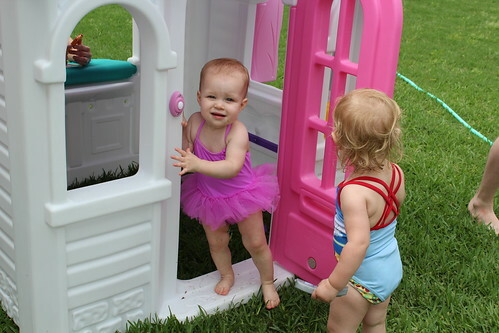 Linking up with Tami’s FO Friday blog today. 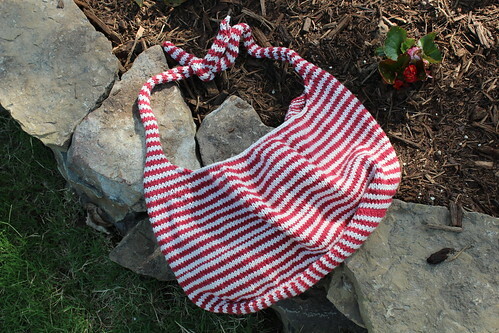 This bag is proof that stockinette in the round with two colors CAN be messed up. I was nearly to the bind off when I noticed that I’d missed a stripe, wrestled momentarily with wanting to frog the whole thing and decided to leave it be. So, the bag has a unique pattern, designed for easy recognition in case it’s ever in a pile with 20 other red and white Medano bags. :p My only complaint was that this bag grew so slowly, due to my decision to use number 4 needles instead of the number 7 or 8 recommended. I do like the density of stitches that the small needles gave me, I’ll just scale the whole bag down a little next time. Happy birthday to my best son in law ever! I truly believe he was sent to us (not just to Bigmommy, thank you very much) straight from above. His gifts of love, faith, positivity, strength, generosity, ideas of fun, common sense, intelligence, loyalty and sense of humor have elevated us all. (He has a ton more assets but I ran out of fingers.) Great father, great husband, great friend, great preacher, great man of God – Clefton, you’ve covered all the bases! We love you! Yeah, it’s pretty hot but I’m baking today anyway. I think I’ll start with Sundried Tomato Basil Bread using my own fresh basil and maybe move on to something sweet, Pull Apart Cinnamon Bread, maybe. 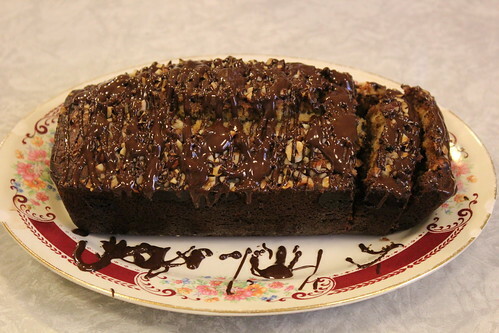 Just a quick post to share a new take on an old favorite: Nutella Swirled Banana Bread. Moist, nutty, with chocolate and banana hints, it tempted me, a dyed in the wool unfan of bananas. 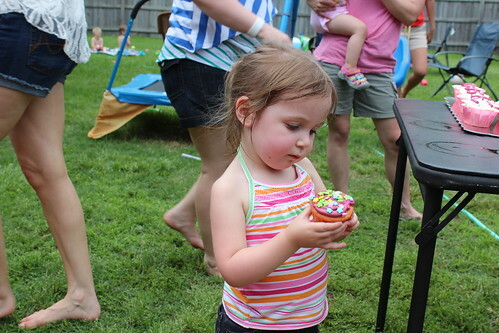 Thanks to Girl Versus Dough for blogging this! I’m still love, love, loving my pottery class and look forward to it every week. Yesterday, we learned about building with coils and how to use an extruder, which is a really quick, easy way to make them. Takes a little bit more upper body strength than I have, but by standing on a stool and leaning my weight on the handle, I can get the job done. Here’s my pottery WIP from yesterday – with emphasis on the WIP! I’m starting to feel more comfortable with the clay, catching on to how it feels when it’s too wet to add details (too wet clay is floppy and will slump and collapse) and then how it feels when it’s dry enough to hold the details or embellishments added. Cool stuff, I think. I didn’t get to finish this little pot, I want to flare the sides more and then narrow and smooth the top; since I’m in a class at the Art Center, I can come and go at the pottery studio when I want, not just at class time. I may go later today and work on it a little more, maybe experimenting some with different sized coils and bases. I love this!! The Sundried Tomato Basil bread was such a success that I want to share it. This isn’t my recipe, so to give due credit, the original was submitted by girlversusdough on tablespoon.com. She has a baking blog, girlversusdough.com, one I’ve enjoyed following. 2. Add remaining flour 1 tbsp at a time until dough no longer sticks to the sides of the bowl. 3. Remove dough from bowl and place in a clean, lightly greased bowl. Cover and let rise until doubled, about an hour. 4. Punch down risen dough and shape into an oval, stretching from the top of the loaf to underneath the bottom. Place shaped loaf in a lightly greased 8×4 inch loaf pan. Cover and let rise until doubled, about 30 minutes. 5. Preheat oven to 350 degrees F. Once dough is ready, bake 15-20 minutes until golden brown. Remove from oven and allow to cool completely on a wire rack before slicing. So good! Thanks girlversusdough for sharing this recipe, it’s delicious! Babymama and I went to lunch earlier this week and I had my first taste of tomato basil bread and now I’m hooked. I’ve baked bread off and on for years – mostly traditionals- whole wheat, rye, white, etc. so today, I’m stepping out of the breadbox (a little baking humor) and trying my hand at a Sundried Tomato Basil Bread recipe that I found on the Tablespoon website. Success! Simple recipe, great flavor. This one’s going in the recipe box to be baked again and again. With cheese, fancy mustard and smoked turkey – two words – different and delicious! Such a pretty loaf!